It was fun painting these glass objects--I tried to find a balance between precision and painterliness. We're flying to Maui this week for our daughter's wedding, so this will be my last post for awhile. It's hard having to leave Oregon in mid-winter for a grueling regimen of white sand beaches and swaying palms, but don't feel too bad for us--we'll grit our teeth and get through it somehow. I'll try to write a post or two while we're there, if it can be done from the laptop. When we return I plan to do some Maui-inspired dailies. See you in a couple of weeks. Have a great time! You'll return energized and ready to crank out painting after painting. Love the lid on your canning jar. I can feel the age in it. My hand wants to wrap around it and feel the rusty grit as I turn it. Good flight 'nd good luck for your daughter, Master Art West! Besides the wonderful sentiments of seeing your daughter getting married, you most certainly deserve such a lovely time out for yourself and your family. I imagine you will be using quite a different color palette for paintings of that part of the world. Looking forward to seeing what comes! Hey Don..before you go to Maui prison..may I post my plagerized rock on my blog for my student and Nick to see? Sunscreen!...right, Susan, I'll put that on the list. Thanks for the kind words and well-wishes. Nice of you to say, Lynne--thanks. Yes, I'm looking forward to the change of scenery and palette that Maui will provide. My bad, I posted it before you said OK! Got all involved in the photo and lighting. THNX Don and have a wonderful trip....congrats to your daughter! Have a great time Don and Brenda. I wish your daughter and husband to be a wonderful day. Enjoy the sunshine and I look forward to seeing the Maui influence on your return. Donald--thanks for those kind words! You continue to do intriguing work. Hi Sheila--thanks for the well-wishes. Happy painting! Beautiful work, Don. These subjects look so peaceful in the subtle light. first time visitor. Love your work. Love your concepts. 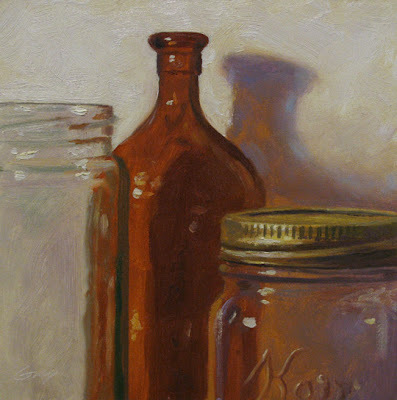 I love your painting of bottles...seems like everyone is painting glass lately. My glass jar is almost finished. I love the colors in this piece...beautiful. Take care! I'm enjoying your still lifes! You reached a good balance with the brushwork. I strive for that too! Congrats on your daughter and what a wonderful place to celebrate. I'm so glad that you didn't get swept away by a sunami (?)! You better bring some Hawaii back; I miss it! Hope the wedding is blessed and that your time there is sublime. I'm looking forward to the work you do under the influence of that special place. I know you can handle the rough climate of Hawaii... congratulations on your daughter's wedding! I struggle daily with that same precision/painterly issue, and I think you did a fabulous job! Enjoy your vacation, and I'll be checking back in when you are home and snug on the West Coast! oooh, can't wait to see your tropical paintings! have a blast! Hi Diana--I appreciate your words. Mark, "painterliness" is yours! :) Thanks for the kind words. Maui was incredible! Susan--welcome to my blog and thank you! Great to get acquainted with your beautiful work. Your glass jar turned out beautiful, Jean. Thanks for the encouragement. Hi Marilyn--Thanks for those supportive comments--it means a lot coming from a fine painter like yourself. And yes, the tsunami--a surreal experience! We counted on Maui being memorable, but didn't know HOW memorable! Add to that hundreds of photos, hours of video, tons of vivid memories and a "Maui" baseball cap--I guess I brought a lot back! Hi Kelley--thanks--good to hear from you! Your new paintings look lush. Thanks, Martha--I'm charged up about trying some Maui stuff. I made a quick skim of your blog just now, which I haven't seen since we left. I love your prolific posts and look forward to going through them in detail.